McGill used high bandwidth to reduce latency on their high definition video conferencing between Seattle and Montreal, so that two way synchronized interaction of musicians was truly possible. Gordon Foote (at left, in Seattle) teaches a jazz ensemble at McGill, appearing life-size in uncompressed high-definition video over three 65" plasma displays. Photo: Peter Marshall. More photos are available here. 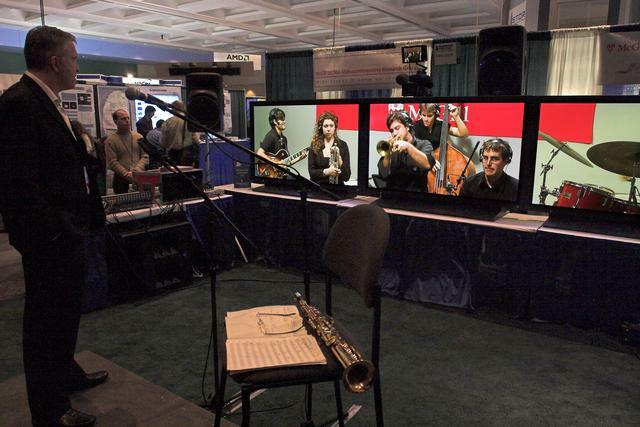 The exhibit booth in Seattle had a panoramic 15' wide screen made up of three 65" plasma displays showing three uncompressed high definition video streams from the Instructional Media Services studio at McGill in Montreal. These streams were sent over the CA*net 4 Internet network across Canada to Vancouver and then down to Seattle using McGill's proprietary IP transmission software that provides extremely high image quality with very low transmission delay. The displays showed people at the McGill end life size in high resolution. The delay was so small that people could talk normally and interrupt one another, unlike conventional videoconferencing. People often described the interaction with those at McGill as startlingly realistic. For the competition, McGill music professor Gordon Foote was in the booth in Seattle teaching a jazz ensemble of music students in the studio at McGill. At the end of the session, he took out his sax and played together with the students, the first time this has been done using high definition video across the continent. For the rest of the conference, there was a model train in the studio at McGill that could be seen and heard in high definition, and controlled remotely from Seattle with a round-trip latency of less than 100ms. Several hundred audience members tried the system, attempting to switch the train between the three loops of track to avoid hitting a mechanical cow that was meandering across the tracks. A vibromechanically actuated platform, on which audience members stood, also reproduced the rumble felt every time the train passed over the bridge -- a real show-stopper. The Ultra-Videoconferencing team wishes to thank all of the technical support personnel who gave their time and assistance leading up to the demonstration. Our "Wide Screen Window on the World" demonstration would not have succeeded were it nor for the technical efforts of Seth Everson (HP), Dave Tyszkiewicz (Neterion), Shaun Case (AJA), Philip Morisson (Foundry Networks), and Thomas Tam (Canarie) who worked through the many problems that arose before and during our setup.